Hershey’s is donating $10 to the Children's Miracle Network for every blog participating in their BETTER BASKET BLOG HOP, up to $5000.00. 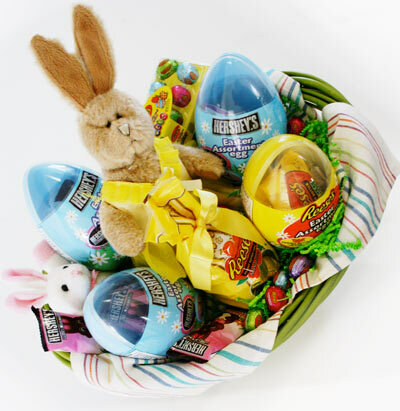 Hurry The HERSHEY’S Better Basket Blog ends at 12 PM EST on April 4th, 2010! Better Basket Blog Hop started as a charity blog meme, bloggers were able to raise $10 by writing a blog post of donating a virtual Easter Basket. HERSHEY’S promised to donate $10 per each post written for the Children’s Miracle Network, up to $5,000. Within the first week, over 200 bloggers participated, and soon it was 400 bloggers, and HERSHEY’S was so impressed by the kindness and caring of the hundreds of bloggers participating that they decided to donate $7,000 in honor of all the caring bloggers who are part of spreading the word of paying it forward this Easter season. Hop to Children’s Miracle Network up to $5,000 – but after so many bloggers participating, Hershey decided to donate a total of $7,000 honoring the kindness of blogger community.